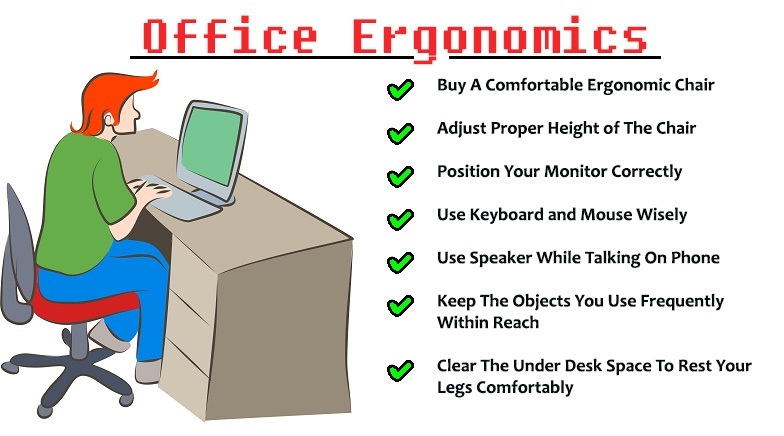 Ergonomics is a comprehensive term used for explaining movements, design and postures of the items which we use in our daily life so that they can fit according to our body movements to promote work efficiency as well as to prevent injuries. Simply saying, ergonomics can be defined as the process of redesigning or rearranging of your workplace, products or particular systems to help people gain better health who uses them. It involves the study of the efficiency of people in their particular working environment. It explains the basic principles of enhancing the work productivity by using better sources which are designed for body angles. How Your Office Is Causing Back Pain? If you are feeling the pain in your neck every time at the end of your work day, it can be due to the heavy stress you placed on your neck while working in your office. Bending your shoulder and neck while talking on your phone, etc. Not only at your workplace, but common activities like playing, sitting, climbing stairs, sleeping, reading, etc. if not carried out with proper posture can cause ache, strain and pain in the body parts. But by using the principles of ergonomics, we can reduce (or completely avoid) the chances of getting the stress, pains and neck aches by manifolds. For keeping your spine and posture healthy, you need to make some basic changes to your workstation/workplace so that you can maintain good posture while working on the computer. By making these changes to your workplace ergonomics you can boost up your productivity while eliminating the chances of getting any neck, shoulder or back pain completely. Here are few points that you should check for improving your computer posture. You should definitely follow them if you want to live pain free life. ✔ Place your computer screen at an arm’s length. Experts suggests that you should keep your screen about 20-25 inches away from you so as to attain a good computer posture. ✔ Top of the computer screen should not be higher than your eyes so that you can view the screen without looking up or down. This also helps in avoiding eyestrain problems. ✔ Use adjustable height or ergonomic seating for proper posture and support. Experts also suggest using lumbar support for getting the best extra support. This will help you sit relaxed when you are working on your device. ✔ Keep your knees and foot relaxed. There should be enough room below your work surface so that you can relax your knees along with the thighs below it while sitting. ✔ Your wrists should not be at an angle while working with keyword or a mouse. Try to keep them straight and in a relaxed mode as much as possible. It is good to place your mouse and keyword next to each other. This will avoid the risk of getting your forearm strained while you are using mouse and keyboard. For enhancing your workplace experience and to improve your posture at work, you can also try adding some great office furniture and accessories that are ergonomically designed for your body. These ergonomic office furniture solutions are a must have for anyone who work hard on PC/laptop for more than 4-5 hours in a day. Here are 10 amazing workstation accessories for you to help rearrange your workstation at the office. These ergonomic office furniture accessories are perfectly designed according to the ergonomics principles and you should try them for sure, as per your body needs. Believe me, you will find yourself much comfortable and healthy when you use these workstation organisation tips while working at your study, office, workplace or home office. Your computer monitor (or a desk) too high or too low can be a reason of fatigue to your shoulders and neck along with lower back region and eyes. Therefore it is necessary to place it at the optimum height so that you can view the screen clearly without any strain. We recommend adding an Adjustable Standing Desk Converter or a Sit-to-Stand Monitor Riser to your workstation which can help prevent all the further health problems related to spine. This will allow you to work in a standing position, when you are bit tired from sitting long hours. Adjustable monitor stand for desk is a must have for people who work for long hours in front of computers. Especially for people who cannot find time to walk or exercise due to their busy work schedule, this sit stand desk converter can be a great thing to have. Using this they can actually walk and relax their legs momentarily which is a good practice for enhancing blood circulation. This type of adjustable standing desk converter comes in a variety of options. If you have a small office area, corner sit stand desk (such as L-shaped or U-shaped sit standing desk), can be a great fit. Or if you are a professional who want to use two monitors at a time, dual monitor stand desk can be a great option for you to check. Whatever your needs are, there is an option for you available. You just need to check the reviews online to find a great one that suits your requirement. Dual monitors are the must have for many professionals like freelancers, bloggers, web designers, musicians, etc. And if you are among the people who frequently uses two monitors at a time, you will need this for sure. Using dual monitor desk mount stand is important so as to ensure that your monitors are placed at a proper height while you are working for long hours. Not only it helps to expand your computer work-space but also help in making it convenient to work. Most importantly using this dual monitor stand or dual monitor riser to your workstation helps in avoiding all sort of spinal health issues which may be caused due to ergonomics or bad posture. While using multi monitor desks or mounts, ensure that you position the monitor straight before you, just below the eye level. If habituated of wearing bifocals, adjust the monitor at 1 to 2 inches for a better view and to be safe from the bright light source. Best dual monitor stands by brands like VIVO, HUANUO, FLEXIMOUNTS and many others are available online to buy at a great price. You can check their reviews in detail before buying one for your desk. For minimizing your spinal pain problems, it is always a good habit to organize your workstation in such a way that you can reach to the objects you need often quite easily. For this, you can keep the main objects (like your telephone, printing machine, pen, paper or a stapler) at a reachable distance which minimizes your reaching effort. It is best to use a computer desk with storage shelves or side drawers so that it can easily accommodate important things keeping them within your reach. Computer desk with hutch or with drawers and shelves are quite popular among people who work at home and want to renovate their home office with something unique, stylish as well as healthy. Additional Tip: Just in case the things are away at a certain distance from your ergonomic office desk, stand up and reach for them slowly – as a form of simple exercise and as an act to take a break after a long seated posture. Now if you are using a standing desk in your office for switching between sitting and standing positions, using an anti fatigue mat is a must for you. With a good fatigue mat like Topo standing desk mat you will love to stand more in your office as it inspires active and varied stances. Topo is a specially designed mat that enables you to stand with just one foot so that you can get a true benefit of standing while using one foot at a time. Using these mats you will surely feel more energized and productive. Experts suggest that it is essential to choose a comfortable office chair with adjustments that supports our spinal curves in addition to giving us a calm posture. Most of the office people love choosing a chair that is ergonomic in nature and can help adjust their body easily for maximum comfort. Ergonomic office chair is the one which basically comes with proper neck and back support and allows you to adjust the height for a proper rest of feet on the floor and thighs comparable to the floor. According to your personal preference and usability, you can choose an ergonomic chair with a backrest or a lumbar support that help you sit relaxed while you are working on a computer. It is good to choose a chair which comes with high back. High back chairs with a good lumbar support are often recommended (instead of low back chairs) specially if you need to work for long hours so that you do not get your neck and back strained. Although there are many good options when it comes to choosing best ergonomic office chair, I personally love using balance ball chair at my workstation which has helped me significantly in relieving my neck and back pain. Desktop document holder for typing and reading is a must have accessory for those who need to type and read simultaneously. Keeping your book or a document at an inconvenient angle, while you are typing on your laptop/pc, can easily strain your neck. And adding a good ergonomic document holder or a document holder for monitor can help a lot in avoiding this pain. While adding a document holder stand to your workstation, keep a note that it should be placed between the monitor and keyboard or just next to the monitor (like in monitor mount copyholder) at the right hand side. This will avoid you from twisting your neck often times for viewing the source materials while typing. Additional Tip: Frequent use of telephone (while typing) also can strain your neck and shoulders. Try to use a headset or speaker for a telephone talk to type in a free way or write at the same time. Chair at high position to the desk can easily create a spine problem. This needs to be adjusted to the height of the desk. In making this adjustment many times your feet struggle a lot in finding a platform to relax comfortably. Avoiding this issue for long can create additional health problems such as leg pain, lower back pain, etc. You should therefore consider using a footrest or a stool to rest your feet on a comfortable platform. Footrest for office desk is in fact an additional workstation accessory which can help you in resting your foot comfortably while working. This will help to keep your knees and feet relaxed and you may essentially need one if your feet feel much tired while working. An adjustable ergonomic foot rest in a form of bean bag is a brilliant option which can be placed under your workstation/desk to make your feet comfortable. Ensure that you create a good clearance for your thighs, knees and feet near the desk for a good support, before you use these ergonomic fort rest for desk in your office or home. Also avoid the storage of unnecessary items under the desk which you use occasionally. Not only your feet, but also your arm needs proper support and comfort while you are working on your office desk. This indirectly helps in keeping your other body parts such as upper back, neck and shoulders healthy. For making your arm and wrist comfortable you can consider using an ergo arm rest or a wrist support pad that reduces the strain on your wrist, arms as well as shoulders to support your forearm much better. In case your desk includes a hard corner, pad it or make use of a wrist rest for a comfortable feel. Studies show that glaring effect on your laptop or PC screen can bring about much disturbances when you are working. This can also many times cause issues such as neck pain, especially at times when you keep your head tilted for long to look comfortably at your screen. Using an anti-glare screen protector can well avoid this glaring problem on your laptop or PC screen thus helping you prevent various health problems. This is a must have for those who have a direct light source present in front of their screen. People who have windows in their room directly in front of their workstation may also consider adding curtains to them for avoiding the problem. Also you can place your workstation in your room in such a way that your screen does not produce any glare affect. People with painful problems such as carpal tunnel find these type of keyboard and mouse extremely helpful. If you type a lot while working these are a must have for you. Using an keyboard and ergonomic optical mouse will help achieve more natural motion when typing and can avoid strain on and around the wrists. These ergonomic keyboard and mouse comes with contoured design and are thus much more comfortable to use than as compared to conventional types. Although these comes at a bit higher price than the normal mouse, it is worth investing the amount if you are really concerned about your best health or if you are suffering from problems like repetitive strain injury. ☑ Tip: If not required you should get a compact keyboard instead of using those large keyboards with extra function keys. Place mouse and keyboard on the same surface with less distance in between to maintain a straight posture of upper arm and hands. Maintain the habit of using keyboard shortcuts in order to reduce the use of extended mouse. Furthermore try to adjust the mouse sensitivity and exchange the use of hand for mouse functions by moving the mouse to the keyboard further area. Also observe the posture of arms and shoulders for free movements. Experts suggest that mobility is important to keep the vertebral discs, present in the back and neck region, in a healthy state. Sitting in front of computer for prolonged period of time at work can put a lot of stress on the discs. So, it is important for you to take frequent breaks which helps in preventing spinal stiffness and stress. A short break at an interval of about an hour can be of great help as taking a break from the continuous use of computer can relieve your muscles greatly. The fact that you are getting up from your chair and taking a short stroll at your bay can be of help. It relaxes and stimulates the muscles that can cause a computer neck and shoulder pain. Exercises have always known to work when it is the matter of shoulder or neck pain. Therefore, the best way you can counteract the prolonged computer usage is indulging in exercises and activities. During these breaks, you can try out some workstation stretches. You can stretch the front part of your neck as this strengthens the muscles in the back. You can breathe deeply from the abdomen and keep your arms relaxed in your lap for few minutes. After this, you can stand and stretch your neck and shoulders for a while. However it is not necessarily important to stretch out during every break. There are lot more exercises that can help you get rid of computer neck pain. Additionally a neck exerciser can help greatly to strengthen the back of your neck. These machines can easily be found at a health club near you. Many people who suffered from these types of pain also tried using therapies such as physiotherapy, acupuncture, reflexology, etc. which are great for getting the relief. Not only your neck and shoulders but also your fingers and other body parts needs some relaxation. So it is advised to relax your fingers and hands between lots of typing or mouse usage. A normal computer user performs tens of thousands of keystrokes daily. And for some of these users awkward computer postures together with repetitions and exertions can cause neck and shoulder pain while you are working at computer. The pain can be associated with nerve, muscle or ligament damage. If you are a regular computed user like me who need to work for more than eight hours per day, it is most recommended that you keep a check on your proper sitting posture at computer along with the workstation arrangement and setup. If you are really concerned about your health and posture improvement, you can add an additional standing desk in your office which require you to stand erect while working. Taking a break from your chair and spending few minutes here can prove healthy for you. This will not only help you in minimizing the repetitive strain injuries (often seen on your arm, hands, neck, shoulder, back, thighs, legs, etc.) but also helps you in leading a pain free life by preventing the neck, shoulders and back pain. Various posture corrector and tools are also available in the market to make your body used to better posture. You can use them daily while working to maintain normal curves of your body no matter whether you are sitting or standing. Props such as lumbar support pillows, posture corrective brace for men and women, posture corrective bra for women, posture enhancing shirts and many more can really help to train your upper back and core muscles. These are worth trying to be a posture fit person. According to office ergonomics guidelines, lifting objects and weights (like lifting heavy boxes while working in industries or at home) in a proper way not only prevent spine injuries but also avoids aggravation of previous injuries. For lifting objects or heavy objects, you should keep your back straight and make use of core muscles, thighs and gluteal. Bending your spine can actually put your spine at the risk of injury and you should avoid this at any cost. Many of us put our most of the body weight on the heels while standing. This increases the chance of getting body aches like pain in lower back, knees, hips, ankles, etc. So it is better for your health to stand with your weight distributed on your entire feet rather than just on your heels. With some practice daily you can easily do this. Well, these are few of the important (yet ignored) things you can add to your workstation for pain prevention and treatment. There are many more of them available online, when you look at them at sites like Amazon. Just check them out and get them as per your personal preference and use. These will surely help to make a drastic change in your life while avoiding all types of back, foot, knees, shoulder and neck pain from computer use.